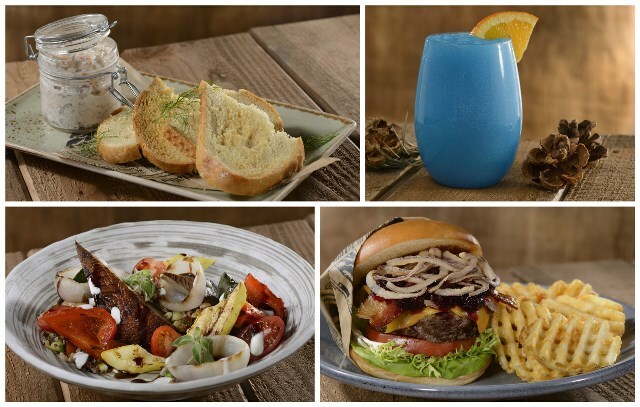 Disney’s Geyser Point Bar & Grill Now Open! New Disney Dining Experience! Make it part of your Disney Vacation Plan! Opening at Disney’s Wilderness Lodge is the new Geyser Point Bar & Grill, where you can grab a bite as you enjoy the resort’s rustic beauty. Located along the water’s edge, Geyser Point is designed with cedar beams and natural stone to fit into the design that’s reminiscent of the Pacific Northwest. At the bar, artisanal sips add an authentic touch to beverage menus, including drinks which feature Pacific Northwest brewers and distilleries, and wines focusing on heritage varietals grown in Oregon and Washington. Small plates include crispy fried oysters with miso tartar sauce; edamame with chili salt; cheesy barbecue brisket with house-made chips; “Shrimp on a Wire” with miso-lime vinaigrette, togarashi (Japanese spice mixture), shishito peppers and chili-aioli; salmon rillettes with sourdough crisps, and handcrafted charcuterie. Open for breakfast, lunch and dinner, a quick-service walk-up window next to the bar makes it easy to order and dine alfresco. Breakfast includes scrambled eggs with sausage and bacon, crab cakes Benedict, maple-cinnamon pancakes and more. For a lighter bite, seasonal fruit is served with lavender honey-yogurt, and steel-cut oatmeal is topped with dried fruit and nuts. For kids, scrambled eggs, buttermilk pancakes and granola with apples, strawberries and honey-yogurt dip is on the menu. Finger Food Sampler with sliced smoked turkey, Tillamook Cheddar, spiced apple jam, grape tomatoes and sourdough crisps. Book and Pall your Disney Dream Vacation! Wilderness Lodge is a fabulous Resort to stay in as well. It’s in the Deluxe Resort category and a quick boat ride to the Magic Kingdom. Outdoor Kitchens & Beautiful Gardens! One of the most welcome signs of spring is Epcot’s 24th annual International Flower & Garden Festival. While the grounds at Epcot are always beautiful, the Flower and Garden Festival takes them to the next level. Included in the Festival, are numerous food kiosks featuring delicacies created with fresh fruits, vegetables and spices. Urban Farm Eats Walkway near Imagination! Plan Your Disney Vacation Now – 2017 is EXCITING! Today, we’re happy to announce one of the park’s newest nighttime experiences, “Rivers of Light,” will make its official debut on Feb 17, 2017. Dining and FastPass+ reservations for this new show are now available. And don’t forget that the next step in the expansion of Disney’s Animal Kingdom – the grand debut of Pandora – The World of Avatar – will take place on May 27, 2017. Let’s get YOUR Magical Disney Vacation Booked and Planned so you can be part of the new happenings and have a front row seat! With the Walt Disney World Railroad scheduled for a lengthy refurbishment, the Magic Kingdom will experiment with a new staging area and possibly a newformat for the Magic Kingdom Welcome Show. Beginning January 9, 2017 the Magic Kingdom Welcome Show will move from the train station to Cinderella Castle stage. In previous years the Welcome Show continued to be offered at the train station. With this closure the park wants to experiment with a new procedure that allows guests to enter Main Street U.S.A. early and perhaps do some shopping, get those great photos and even some early morning dining in before opening the Magic Kingdom attractions after the welcome. “With more guests arriving early to the Magic Kingdom park, we are enhancing the morning arrival experience by opening Main Street U.S.A. earlier than the rest of the park. MVMCP, Disney’s biggest holiday event, features exclusive holiday entertainment, snow falling on Main St., & complimentary cookies and hot cocoa. This is a special event with its own ticket. The event “officially” begins at 7:00 pm and lasts until 12:00 am. However, if you don’t have a theme park ticket to enter the Magic Kingdom for that day, the Castmembers will generally allow MVMCP ticket holders entrance about 4:00 pm. People often ask about the least crowded parties and which days they should attend. November party dates will almost always be less busy than December dates, and Tuesdays are usually less crowded than parties offered on other days of the week. “Mickey’s Most Merriest Celebration” will make its debut for the 2016 holiday season. In this all-new show, Mickey and his pals invite some of their friends over for an unforgettable Christmas party filled with music, dancing, color and fun. Look for Woody and Jessie from “Toy Story,” Fantasyland friends such as Peter Pan and Snow White, and many more! Not all of the rides and shows will be open during Mickey’s Very Merry Christmas Party, but many will and with very little wait times. Note that FastPass+ is not available during the party (and for most attractions, it’s not needed anyway). You have 5 hours to enjoy the special events that take place during this party so use your time wisely. Watch the parade but wait until the second one since it’s less busy and you can do other things during the first one. Attend the shows – they are exclusive to this party and can’t be seen any other time of year. Eating – you can get cookies (including a gluten free option), cocoa, apples, and apple juice at many locations and there are some restaurants open but we wouldn’t spend too much time on that. Be sure to eat before the events begin so you can spend your time doing other things. Have a big sit down lunch this day! Doing things that are not exclusive to this party which includes meeting some characters and riding rides. If you’re attending on a busy night, focus on the exclusive things as opposed to things you could ride during the day. If you’re attending on a less busy night, the short lines for rides are a lot of fun to take advantage of. If you want to do a popular character meet, line up early. If you want to meet popular characters like Jack Skellington and Sandy Claws, line up around 4:30 for that (he often shows up before the party begins, sometimes as early as 5). If you want to meet the Seven Dwarfs, line up around 6:00 so you can see them as soon as they begin meeting people at 7. Want to meet the princesses w/their princes? Get in line around 6:30 for that. Celebrate the Season at 7:30 p.m. Celebrate the Magic at 9:15 p.m.
Holiday Wishes Fireworks at 9:30 p.m.
Mickey’s Once Upon a Christmastime Parade at 10:30 p.m.
For $60-70/person, you get up to 8 hours in the park with an exclusive parade and fireworks, special character interactions, low wait times on rides, with cookies and cocoa. We love the Christmas party and think it’s worth it for most people, although due to the late hours, we don’t suggest it for most families with young children. Late nights and sleepy kids turn into grumpy families – no pixie dust there! Stay and play—and feel like a character in favorite Disney films—with Disney Story Rooms at select Walt Disney World® Resort hotels. Disney Story Rooms offer you and your family the kind of fantasy and adventure that lasts throughout your entire vacation. invites you to become a part of beloved Walt Disney Pictures and Disney·Pixar animated films in family suites in Finding Nemo and Cars and Walt Disney Pictures’The Lion King, and standard rooms inspired by Walt Disney Pictures’ The Little Mermaid. Standard rooms sleep up to 4, while suites sleep up to 6. From the magically themed family suites and rooms to the zero entry pool, this Value Resort will immerse you in one of four wonderful “worlds”—for a colorful journey through the story of each film. These rooms are designed to make you feel as if you’ve “set sail”, with ship-themed beds and other swashbuckling touches-from the light fixtures to the special artwork on the walls. Aaaaarrrrgggg! are quarters befitting the Princes and Princesses of the family. Here, the remarkable décor and rich details will place your family right in the middle of classic Disney stories. Brought to life by celebrated Disney Characters, each room is fit for royalty. Enjoy magnificent touches and magical surprises, including custom drapes and linens, ornately decorated beds-and headboards that glitter with a fiber optic “fireworks” display. You’ll enjoy majesty and fun, all rolled into one! Magic Itineraries, Authorized Disney Vacation Planner will help you decide which Resort will fit your idea of the ideal Disney getaway – one your family will cherish forever. Disney Dreams really can come true! Put us to work for you! What’s Going On at Animal Kingdom? Rivers of Light! Is it Happening or Not? Park hours. Getting shorter. The Jungle Book: Alive with Magic!, being cancelled already? Will the Tree of Life continue to light up at night or not? Planning a Disney vacation, especially if you’re wanting to visit the Animal Kingdom Park for evening event, will be disappointment this fall and winter. All good questions. Answers are far and few between. The Jungle Book: Alive with Magic is going away after Labor Day. This show, thrown together at the last minute, was a temporary show anyway, to keep guests entertained until the main attraction, Rivers of Light could be completed and rolled out. Alive with Magic was lukewarm at best. As for the Rivers of Light? No news if or when this long over due show will ever see the light of day or the shadows of night. A lot of money sunk into a project that we may never see or will not see for a very long time?? One has to wonder why. We’re sure it boils down to money. We’re also wondering about the Tree of Life and it’s magical lighting at night. The park hours have been getting shorter. From 11:00pm to 9:00pm and now 7:00pm as we get closer to fall and winter. No word on whether the Tree of Life will be lighting up or not. So, we went from the excitement of this park being open for more hours of fun and thrills to not. We’ll have to wait to see what they come up with in the coming months and years with the opening of Avatar. There is still plenty to do in Magic Kingdom, Epcot and Hollywood Studios, and if you’re a shopper, you’ll love Disney Springs!! Let us help you plan your next Disney Vacation so you’ll get the most magic, and navigate all the pros and cons, so your Disney experience will be the best fir for you! Beginning on June 7, Guests traveling on a Disney Cruise will be abile to pre-book two Meet & Greet opportunities with Disney Characters through the My Disney Cruise section of DisneyCruise.com. Guests sailings on cruises of 7-nights or longer that feature at least two sea days will also have the opportunity to pre-book a special Character Breakfast online. This is good news for all your parents who have a Princess or two who LOVE all or a few of those Disney Princesses and are a must see when visiting Disney. This added feature will make every little girls heart melt and dream come true! Get the Princess dresses ready, cameras and autographs books too. If you are interested in pre-reserving tickets for the Princess Gathering, Frozen Meet & Greet or a Disney Character Breakfast (if applicable) during your cruise, we encourage you to visit the My Disney Cruise section of www.disneycruise.com . This can only be done, once you have paid for your cruise in full and the “window” has opened for you to book your advance registrations for Port Adventures, Spa Treatments, Adult Dining and other fun activities. If you haven’t already booked you dream Disney cruise, call us and we’ll get you booked and ready for your magical memory cruise! Concierge Guests will not need to pre-book these experiences. Character Meet & Greet opportunities and Character Breakfasts will be pre-booked ahead of time by the Concierge Team. This makes booking a Concierge Suite even more attractive!